Contemptuous of international law, the US makes no secret of its plots to overthrow the leaders of internationally recognized governments that reject the neoliberal New World Order.Iran is at the top of the US enemies list. The US has been at it since the 1979 Iran Revolution, when the Iranian people overthrew the US’s “our boy”, the Shah of Iran, Mohammad Reza Pahlavi. The Shah had become the US’s “our boy” as CIA agent Kermit Roosevelt referred to him in 1953, when President Dwight D. Eisenhower overthrew the popular democratically elected Prime Minister Mohammad Mosaddegh. Overthrowing governments isillegal according to US law and international law. It is also immoral if one believes in democracy, self-determination,and the sovereignty of nations, respect for human life, and the rule of law. The crushing economic sanctions now unilaterally imposed by the USon Iran are causing massive suffering and the deaths of thousands of Iranian civilians. The US response is glee that the sanctions are “working”. This is nothing short of barbaric siege warfare to starve the Iranians out. Under international law the Iran sanctions maybe illegal, since they are not authorized by the United Nations. The collective punishment of economic warfare is immoral, economic terrorism and a weapon of mass destruction. Secondary sanctions that impose sanctions on non-US and non-Iranian financial institutions that transact business with Iran amounts to blackmail, especially since it is the US that violated the Iran Nuclear Deal, and not Iran. George H. W. Bush’s New World Order neoliberals and neocons despiseany country that closes its doors to US corporate exploitation, and instead uses its own natural resources for the benefit of its own people. The US uses “human rights” to attack countries such as Venezuela, Libya, and Iran that consider economic freedom from need a human right. One of the main reasons that Iran’s moderate President Hassan Rouhani negotiated the Iran Nuclear Deal was so that the lifting of UN Security Council economic sanctions would give Iran the much needed ability to increase social spending for the Iranian people.Instead, the imposition of even harsher US unilateral sanctions by the Trump neocon stacked administration has dashed Rouhani’s hopes, and makes the economic situationdirer for the Iranian people. The nefarious purpose of sanctions is to make the Iranian people suffer so that they will become disgruntled and rebellious. The Foundation for the Defense of Democracy (FDD) is a right wing neocon funded and infested think thank that has been particular rapacious inattacking Iran. FDD executive director Mark Dubowitz has been previously hailed as “the architect of many of the Iran sanctions”, as reported by The Nation magazine, How the Anti-Iran Lobby Machine Dominates Capitol Hill. “I’m concerned about solving problems of the deprived classes of the society. For instance, solve problems of 1000 villages completely. How good would it be if 1000 points of the country are solved or 1000 schools are built in the country.”…The Execution of Imam Khomeini’s Order. Liberals often consider economic sanctions an acceptable, even humane, alternative to force. Nothing could be further from the truth, and progressive people everywhere need to recognize it. Economic sanctions are violence. The Geneva Conventions recognize that siege warfare and collective punishment against civilians are war crimes. How could something that is illegal in wartime be legal in peacetime? The International Committee of the Red Cross has often raisedconcerns about economic sanctions, including UN authorized economic sanctions. Gore Vidal was one of the great American intellectuals, writers, commentators and critics of US foreign policy, domestic politics and society. He coined aphrase to describe the US’s memory loss of inconvenient truths: “The United States of Amnesia”.Most Americans are illiterate about US history. They cannot even remember recent events that happened in theirlifetime. Today people barely remember what happened prior to the current 24 hour news cycle. Now that the destruction of Iran is at the top of the to-do list, the people of the “United States of Amnesia”have forgotten all the countries that the US has destroyed in just the past quarter of a century. It has gone down the memory hole.Anything that happened in the 70’s, 80, and 90’s has been completely lost in the fog of amnesia.US victims are not so forgetful. The USis still deconstructingAfghanistan, after using it as a pawn in the Cold War. The evil masterminds of the invasion of Afghanistan in the late 1970’s were Zbigniew Brzezinski and Jimmy “Mr. Human Rights” Carter. 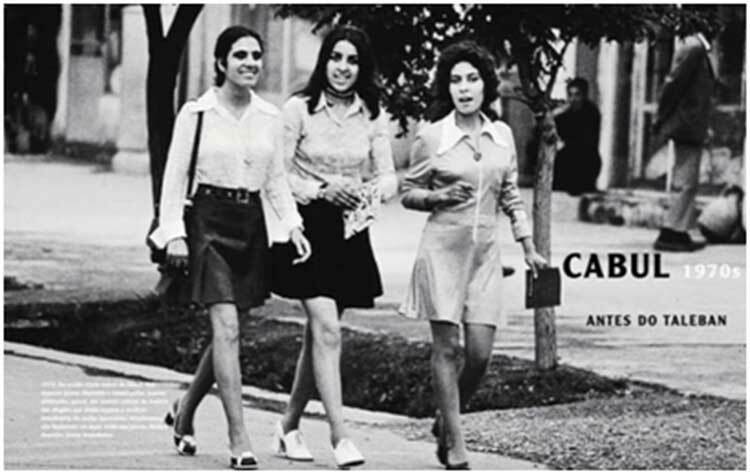 Together they snuffed out Afghanistan’s budding development and women’s emancipation, which was developing nicely under a communist government. Using Afghanistan’s development as a weapon, the US recruited the fanatical mujahideen to overthrow the communist government. Brzezinski and Carter where elated when the Soviets intervened to help their neighbor. It was Brzezinski’s plan, and the Afghan people, especially the women, paid the price.Millions of Afghans have died, and become widowed and orphaned, thanks to President Carter, and his successors. In2001 Bush’sre-invasion of Afghanistan was planned by the neocons ofthe Project for a New American Century(PNAC) even before the attacks of September 11, 2001.The casus belli was oil and gas pipelines, and not terrorism. The Afghanistan Taliban government was told that they could either accept Union Oil of California’s proposed “peace” pipeline with a “carpet of gold”, or else the US would give them a “carpet of bombs”. Osama bin Laden was not a priority. The Taliban had offered before and after 9/11 to present Osama bin Laden for trial, but the US rejected the offer. They had no evidence against him. Once the Taliban government was ousted, thenBush became bored with Afghanistan. According to Bush’s Secretary of Defense Donald Rumsfeld “there aren’t any good targets in Afghanistan, and there are lots of good targets in Iraq”. Instead of being a no-fly zone, the Libya mission carried out over 5,800 bombing sorties and 309 cruise missiles strikes. That is not a no-fly zone. The US and its coalition were the airforce for terrorists bent on destroying Libya’s secular government. Just like what would later happen in Syria, the “Arab Spring” that the US said it was protecting wereterrorists that belonged toAnsar al-Shariah, Abu Obayda bin al-Jarah Brigade, Malik Brigade and The 17 February Brigade, which are all al Qaeda-type terrorist groups. They are the ones that later had a dispute with the CIA, and attacked their outpost in Benghazi, killing US Ambassador Christopher Stevens and three CIA operatives, on September 11, 2012. What was the CIA doing in Benghazi, anyway? Having turned the once prosperous Libya into a chaotic hell, the U.S. raided Qaddafi’s arsenal of weapons and sent them via a CIA rat line that went through Turkey, andon to the Syrian anti-Assad “rebels”. While U.N. Security Council resolutions are binding on all member states, Resolution 2231 (2015) had enough loopholes that gave the U.S. technical grounds to virtually walk away from it. Iran, North Korea, Cuba, Venezuela, Russia, China and anyone else doing business with the U.S. should always remember that the UScan not be trusted to keep its word. The US maintains that Iran has violated the spirit of the JCPOA on several grounds, although none of those issues were part of the JCPOA. According to the Trump administration the Iran Deal is “the worst deal ever” because it does not prevent Iran from testing ballistic missiles, supposedly Iran is the “number one” sponsor of state terrorism, and the UScomplains about Iran’salleged abuse of human rights. The real reason the US violated the Iran Nuclear Deal is that the US will be satisfied with nothing less than “taking out” Iran. That is what the US has wanted to do since 1979, even before PNAC came along. Iran has a right to prepare to defend itself. It is surrounded by hostile countries and constantly being threatened by the US and Israel. 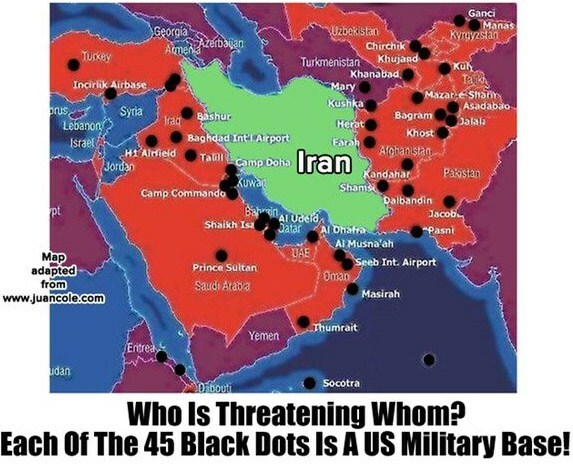 For years the US has threatened Iran overtly and covertly. Repeatedly the US says that “all options are on the table”. It is against international law and the Nuclear Non-Proliferation Treaty for the US, a nuclear power, to threaten a non-nuclear power. It encourages proliferation.Iran has a legal basis for withdrawing from the Non-Proliferation Treaty, and acquiring nuclear weapons to protect itself from the threats of the US, if it so chose. That is what North Korea did, but Iran has not chosen to do so yet. It is the US that sponsored death squads throughout South America in the 1980’s to back right wing dictators. The US created the Contras in Nicaragua after the Nicaraguan people had overthrown the hated US backed right wing dictator Anastasio Somoza. In 1986 Nicaragua even won a court case in the UN’s International Court of Justice,Nicaragua vs. the United States. The US thumbed its nose at the ICJ. In 2002 the US was openly exposed in its unsuccessfully coup against democratically elected President Hugo Chavez of Venezuela. In 2009 the US supported the military coup in Honduras that overthrew a democratically elected President Manuel Zelaya. Afterward Honduras became the murder capital of the world for journalists. Indigenousnative people are still being terrorized, and driven off their traditional land in favor of large corporate landowners. The history of US terrorism is too long to even summarize in this short essay. Afghanistan was already mentioned above. The CIA backed and Saudi financed mujahideen have become a plaguethat has spread throughout South and South-west Asia, as well as Russia and China. The Saudis have provided much of the financing for US sponsored terrorists. The US is openly backing the terrorist groupMujahedeen-e-Khalq (MEK) to infiltrate and terrorize Iran.The MEK was on the US State Department’s list of designated terrorist organization until 2012, when Hillary Clinton had them removed. The MEK has killed Americans, “bombing the facilities of numerous U.S. companies and are killing innocent Iranians”, according to an article in Politico. The MEK has committed acts of terrorism in Europe too. Trump has openly bragged that the US is sponsoring MEK terrorists in Albania to infiltrate Iran. John McCain, who has never seen a US regime change project he did not like, has praised the MEK. John Bolton, Newt Gingrich, and Mitch McConnell among manyothers regularly show up as highlypaid speakers at MEK events. The MEK is a weird and dangerous cult of personalities run by husband and wife Massoud and Maryam Rajavi. They are “responsible for bombings, attempted plane hijackings, political assassinations, and indiscriminate killings of men, women and children”, according to an article in Politico. Israel is the US’s “cat’s paw” in the Middle East. The US supports Israel 100%. Israel’s illegal occupation of the West Bank and the building of illegal settlements deprive millions of Palestinians their civil, legal and human rights. Israel has turned Gaza into an unlivableconcentration death camp for 2 million people. They have been deprived of basic services such as clean drinking water, electricity and medicine. When Gazans have peacefully protested,Israeli snippers have gunned them down by the hundreds during the “Great March of Return“. The US has killed millions of human beings, just in the 21st century, in its wars of aggression. Its drones vaporize wedding parties and funerals. The US abducts people arbitrarily and tortures them in black sites. The US backs 73% of the world’s fascistic dictators. With 5% of the world’s population the US holds 25% of the world’s prisoners in conditions that are for-profit and inhumane.The US is continuing its long history on the Southern border of locking non-white children in cages. The disgraceful Guantanamo Bay is still open despite Obama’s 2008 promise to close it. In conclusion, when somebody on the inside of the establishment like General Wesley Clark says, as he did in 2007, that the US had planned in 2001 to take out 7 countries in 5 years, then we should take them seriously. The US has invaded and attempted to take out most of the 7 countries on Clark’s list. Stop believing the US lies every time the US decides to take out a regime based on nebulous humanitarian reasons, or because they are a so-calledaxis of evil. [This article was first published by The Real News Network. It is the original work of David William Pear. There is no copyright, and it is available free to any publication in the world that wants to publish it in any language. Editing is permitted for spelling errors, grammatical errors, to fit the space of the publication or any other purpose except to change the intended meaning of the article. You may change the title. You may use the suggested graphics, your own or none. Please share and distribute widely. Thank you. My contact email is dwpear521@gmail.com]. David is a progressive columnist writing on economic, political and social issues. His articles have been published by OpEdNews, The Greanville Post, The Real News Network, Truth Out, Consortium News, Global Research, and many other publications. David is active in social issues relating to peace, race relations and religious freedom, homelessness and equal justice. David is a member of Veterans for Peace, Saint Pete for Peace, CodePink, and International Solidarity Movement.In 2017 David spent 3 weeks in South Korea researching the Korean War of 1950 to 1953. In 2016 David spent 10 weeks in Palestine with the Palestinian lead non-violent resistance group International Solidarity Movement. In February of 2015 he was part of a people-to-people delegation to Cuba with CodePink. In November of 2015 he was a delegate with CodePink to Palestine to show solidarity with Palestinians. David frequently makes people-to-people trips to Russia as a private citizen. David returned to Palestine for 10 days in March 2018. David has a Bachelor of Science degree in economics from the University of Maryland and attended classes at George Washington University for a degree as a Certified Financial Planner. He is a graduate of the Wharton School of the University of Pennsylvania program for a degree as a Certified Investment Management Analyst (CIMA). BUY YOURS NOW Online! The current edition of the War Resisters League’s famous “pie chart” flyer, Where Your Income Tax Money Really Goes, analyzes the ..
Hey You start organising elections in yoour country to restore democraty.